As we might expect of from a history professor (LSU), Isenberg begins at the beginning—that is, she offers us an English context for the people selected to inhabit the early settlements in America. In doing so, she reminds us that a variety of whites came along with the storied religious Pilgrims and Puritans as well as the Virginia Gentlemen. She does not ignore slavery and the increasingly well-known horrors of African Americans. Rather, she focuses our attention on the laws and attitudes that excluded a white underclass from enjoying the opportunities of the wealthy rulers who governed the inhabitants of the eastern seaboard. Twelve chapters, with catchy titles and colorful language aimed at classifying the poor whites, expose the uncharitable manner in which the elite used their power to keep a certain group of white people within limited boundaries. We discover American leaders identified common characteristics of laziness, low ambition, and a general uncleanness of people variously labeled rubbish, poor white trash, clay-eaters, and mudsills. Often, quoted leaders use breeding analogies to refer to the quality of human stock. Blood lines and the importance of good parents are linked as explanations for the status of the poor and their characteristics that serve as missing rungs on the proverbial ladder of success. When the theory of eugenics arrives in the US, we see many leaders embracing the beliefs like converts to a tent revival. 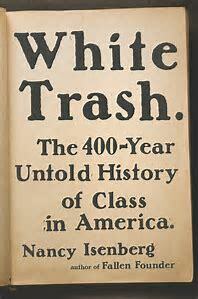 From time to time we learn of plans to improve the lot of poor whites. There are efforts to give ambitious people a parcel of land, which often required the removal of Native Americans. As we move into the 1900s, we learn of the political battles over such efforts as FDR’s programs during the Great Depression when there was visible evidence of downward mobility and later, Johnson’s Great Society. Helpfully, Isenberg points out the uselessness of the occasional celebrations of poor folks who make it. Sometimes she points out the false claims of the rags to riches stories. At other times, she reminds us that such celebratory news stories are rare events and not typical of the vast underclass that remain at a considerable distance from the halls of wealth and power. By the time I reached the end of the book, I felt overwhelmed by the stories used to support her thesis. Indeed, America has an underclass. Although some of the stories are new to me, I was familiar with others from various sources such as PBS documentaries, textbooks on history and sociology, and living amongst the poor and middle class for most of my early life. Nations have myths so it is not surprising to learn that many of the American myths were quite detached from reality. What is interesting is the degree to which the myths and belief systems create such an effective class structure. I am no historian but I like to think of other possibilities to account for a set of findings. Isenberg has focused on the underclass in the early American colonies and the persistence of the poor whites in the American South. Having lived in New Mexico for some years, and finding many poor who were nether white nor of British heritage, it seems her thesis needs to be broadened to consider the influence of the Spanish who ruled vast swaths of what is now the United States. And why not consider the influence of French culture on mid-America—especially since the French held sway where the author lives and works in Baton Rouge? Another factor that seems to be missing is a careful analysis of the role religion plays in maintaining or limiting the status of poor whites. After all, regardless of which European country the ancestors of America’s whites called home, most Americans have identified with some brand of Christianity. From time to time we hear advice to respect authority in church and in society. Isn’t religion and important factor in the status of America’s class system? Isenberg’s attacks on breeding myths, blood, and eugenics are important. Such ideas rule even amongst those with graduate degrees in biology and the behavioral sciences. Nevertheless, she appears too dismissive of biological factors in accounting for the factors that make life a significant challenge to acquire and education or job skills that could become the path out of poverty. Finally, I am disappointed in her lack of consistent comparisons across the historical time periods. Sometimes we are treated to quotes from influential political leaders, including the founding fathers. At other times she delves into the details of a novel or a play. What’s missing is some sort of weighting of the contribution of different sources to an understanding of why we continue to have an underclass. So far, I am fortunate to have experienced the traditional American Dream. Our first home in America was indeed a filthy, insect infested, block rental house. Both of my parents left school at age 14, which was not uncommon amongst their peers, but considered a factor in poverty discussions. We were fortunate to have help from neighbors--a few white families and one black family--community makes a difference. And my father was healthy enough to work loading concrete blocks on trucks--health is worth a lot. When we needed more money, my mother was fortunate to find employment in retail shops or cleaning homes. In addition to the early start, I am now aware that I benefitted from white male privilege. But I recognize, that there are many white Americans who remain poor. And there are many reasons for their ongoing struggle. I suggest the book will be useful to those who are unaware of the attitudes of America’s elite toward the poor and the history of false beliefs about why some people fail to achieve a modicum of independence from reliance on government support and help from area charities. Readers will not find a broad consideration of the causes of poverty or effective ways to raise their standard of living.